Do you wake up still feeling tired? Do you need to punch your pillow to make it feel “just right?” Do you experience neck pain or stiffness in the morning? If you answered “yes” to any of those questions, you might need a new pillow. A good pillow will support your head and neck to provide a natural alignment for your spine, giving you a healthy sleeping position for a good night’s sleep. When you’re shopping for your next pillow, check out the Mediflow Floating Comfort Pillow. Keep reading to learn more and find out how you can win your own Mediflow Floating Comfort Pillow! The Mediflow Floating Comfort Pillow is an innovative new pillow (yes, there are innovations in pillows!) that is clinically proven to improve sleep. 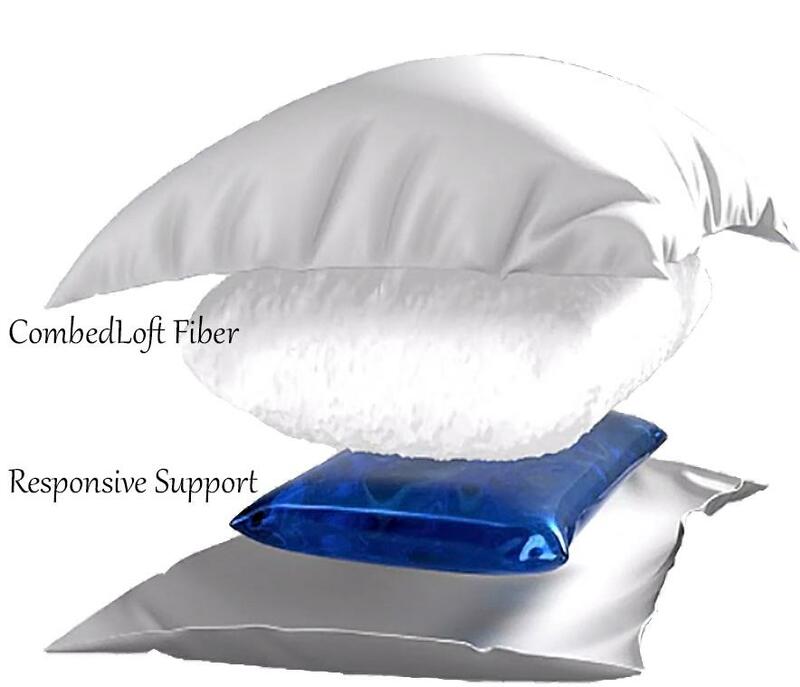 The Mediflow Floating Comfort Pillow combines a water-filled base with an exclusive CombedLoft fiber comfort layer. The result is a pillow that can be adjusted for any support level and will provide unique, responsive support and comfort. 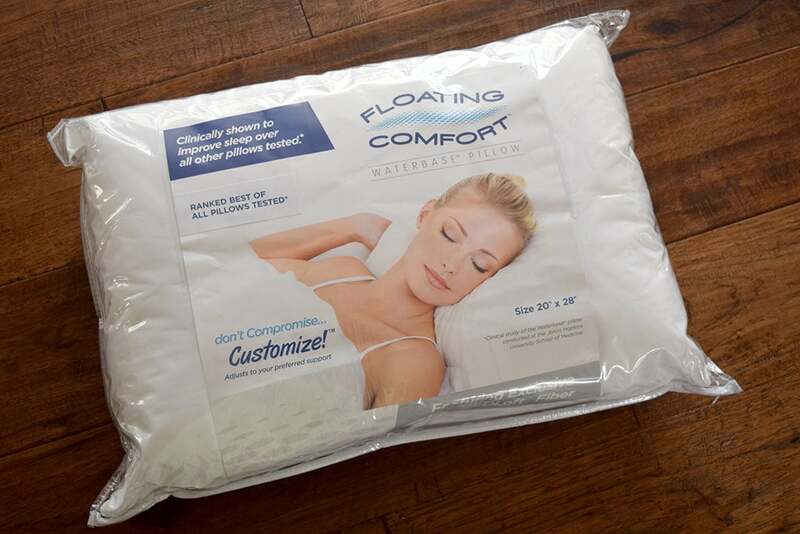 The Floating Comfort Pillow comes with a removable, machine-washable, 300 thread-count pillow cover. To get started, you simply fill the water layer with the amount of water needed to get your desired firmness. The more water you use, the firmer the pillow is. I love that you can add or remove water so you can get the perfect amount of support for your comfort. I’ve been using the Mediflow Floating Comfort Pillow for a few weeks and am simply amazed. It is incredibly comfortable and keeps your head much cooler than a traditional pillow. The layer of CombedLoft fiber is very soft and gently cushions and wraps around your head. This helps support your head and keeps it from falling to the side while sleeping on your back. The water in the responsive support layer moves with your head, so you’re getting the support you need even if you move around. It’s been noticeably easier for me to fall asleep using the Mediflow Floating Comfort Pillow. Other pillows constantly needed to adjusted, moved, and fluffed. Whether I’m sleeping on my back, side, or stomach, my head and neck always feel supported. I used to occasionally experience “morning neck pain” that I associated with sleeping at a weird angle. Since switching to the Floating Comfort Pillow, I wake up each morning feeling refreshed and pain-free. If you’re experiencing restless nights and think a new pillow might be the solution, see if the Mediflow Floating Comfort Pillow is right for you! It’s also a great gift for spouses and loved ones who could use a better night’s sleep! Enter now for your chance to win your very own Mediflow Floating Comfort Pillow! I like that one can adjust the firmness to suit one’s own comfort level. I like a firm pillow, this would be perfect for me. 🙂 Thank you. I love that it helps you get to sleep faster and helps you sleep deeper. I like my pillow to be somewhat firm so the water base sounds great to me! I love that it helps reduce neck pain. That alone makes it worthwhile to me. I love that it can help reduce neck pain. We need that! You can adjust the water level to get the support that you desire. I like that it can help reduce neck pain. i am excited to try it because it can reduce neck pain which has been an issue for me in the past. I think it would help reduce pain. I love that this product has so many high reviews. I struggle finding pillows I like, so would love to try this. I like that it is made with a therapeutic design. I like that it has water filled support for extra comfort. What I love about this pillow is that the user can control the firmness of this pillow! No more purchasing pillow after pillow trying to find the best one~! My favorite part is that you can adjust how firm you want your pillow. Reducing neck pain would be good for me!! I like that you can adjust the water level to get the support that you desire. It would be great to get a good night sleep. This pillow looks like it could help me to achieve that. I like that the firmness/softness can be adjusted and that it contours to your head and neck as you move throughout the night! I radiate heat, and one of the things that’ll wake me up is when my pillow gets hot. It sounds like this pillow would solve my problems! I like that it is customizable. Thanks! Thank you so much for the great offer. I love your site, and I need a new pillow! I like that the pillow can be adjusted for different levels of support! I like that it has been reviewed by Johns Hopkins University! I like that it would help my neck pain. I keep trying different pillows and nothing helps. I like the Dacron Combed Loft Fiberfil. I would love to get a good night sleep again. I love how this pillow is extra soft and has a 10 year warranty! I love that the pillows have already had thousands of 5 star reviews from happy sleepers all over the world. I like that this pillow helps to maintain proper alignment of the head and neck.! I like that it helps reduce neck pain. I love the fluid core. This pillow looks like it would be exactly what I need. I can never find a good pillow. I like that you can adjust the firmness of the pillow. 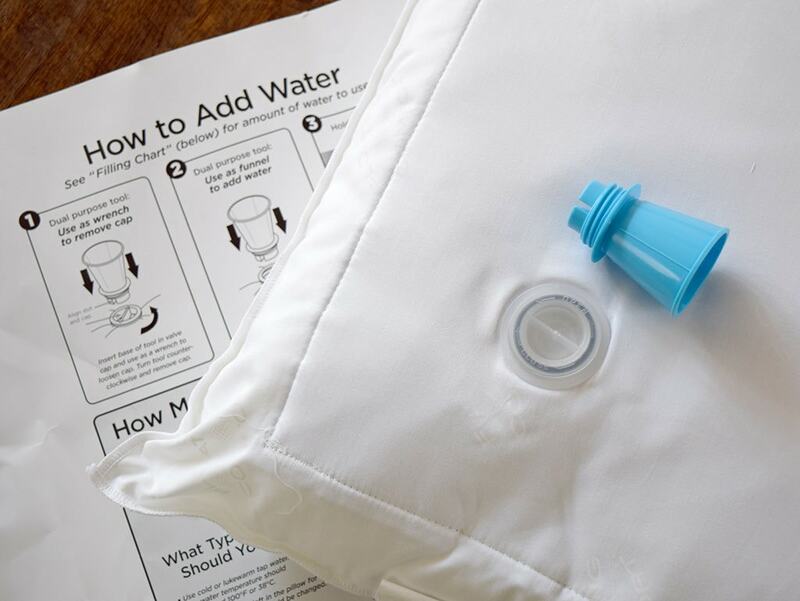 I like how this water technology lets you go to sleep faster, sleep deeper, awake less often. I love that it can help reduce neck pain, I need that! 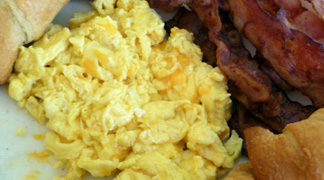 Its been scientifically proven to improve sleep quality. I like that you can adjust the firmness level. awake less often. This would be great. I like that it will keep your head cool throughout the night. I like that the water base adjusts as you move during the night. It would be wonderful to have an adjustable pillow that would be comfortable for me! I wake up with neck pain, so I would love to try this out. I like that it supports you even as you move around. I would love a comfortable pillow. Thanks! I like that it’s different from other pillows. Especially the waterbase technology that is suppse to help reduce neck pain! I like the feature that lets the water in the responsive support layer move with your head, so you’re getting the support you need even if you move around. I really like that it adjust the waterbase to your personal water filled support preference . I am interested in the water feature. I think that would really help my neck. I’m intrigued with the claims that the pillow can help with deep sleep and waking up at night less often. I like the options they offer in different pillows for your specific needs. I love that its firm. I prefer really firm pillows. I love how comfortable it looks and how it adjusts. I would love to have a pillow like this one. I do have a hard time getting to sleep every night. I am always flipping my pillow over and over. I love that this pillow holds its shape throughout the night..
i love that you can fill the waterbase to your desired preference. It sounds so comfy! Filled with water! I loved my water bed so I’d love to try this! I like that it contours to you. I love that it will work even if you’re a side sleeper. I love that it would help with neck pain. I love that the Mediflow Floating Comfort pillow features a 10-year quality warranty and a 60-day satisfaction guarantee. I like how you can adjust the water leve. I like that it is so adjustable & that it stays cool. I like how I can adjust it to my own comfort level. I really love a very firm pillow so the fact that I can adjust this means this would be a great pillow for me! I like that they have a 10 Year Warranty. I like that it so adjustable and especially like the water feature. I want to try one of these pillows. My pillows always end up bunched up above my head or pushed between the mattress and the wall. I like that the Floating Comfort Pillow will help you to fall asleep faster and stay asleep! I like that you can adjust the feel of the pillow with the amount of water used. This way you can keep adjusting it until it’s just right for each individual. I like that you can adjust the water level. It’s cool you can adjust it! I would need to try this pillow but it seems to be the exact thing me and my wife need. See that we both suffer from next pain when we wake. Also i didn’t know that you needed to replace your pillows so often and it seems interesting that you can adjust the firmness to meet your needs. Sounds great cant wait to get them shipped! I love that this can help reduce neck pain. I like that you can choose your personal comfort level. Go to sleep faster, sleep deeper, awake less often and feel great in the morning. For sure all that extra good sleep is my FAVORITE feature. I can’t wait! Every time is the best time. This is the first time I ever heard about a Waterbase Technology Pillow. I would definitely be interested in trying it out. . I love the water base technology! It’s brilliant. I’m willing to try anything! I LOVE THAT IT HELPS REDUCE NECK PAIN. I like that it says it’ll help with neck pain. I sleep pretty well most of the time, but when the kids get into the bed, I get bad neck pain. This would be great to try to see if it actually helps! Thanks for the opportunity. I love that it helps reduce neck pain. Neck pain is terrible and sometimes effects how my day goes, so it’s great! The adjustable firmness would be great! I love that you can adjust the firmness to what suits your preference and to help alleviate neck pain. I love that is waterbased and it adjusts just for me. I like that it is soft and that you can adjust the comfort level. My current pillow is pretty bad. I think the adjustability of this pillow is a great idea. I love that it can help reduce neck pain. I like the adjustable water chamber to soothe neck pain. I like that it will keep my from getting a stiff neck at night, I have never seen a pillow like this. I love that it will conform to ANYONE and my husband would finally be able to sleep through the night with it! I like that it has a water-filled base. I like thatit helps reduce neck pain. I could really use this. I like the reduction of neck pain which is featured in use of the Mediflow Floating Comfort Pillow. I like that it helps reduce neck pain! Would love to try this pillow! I love the fact that it stays cool. I get so overheated sometimes when I sleep. I like the 300 thread-count pillow cover. I like that you can adjust it for any support level you desire. 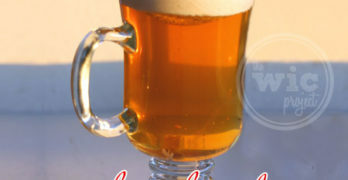 I like that you can adjust the firmness of it., Plus, you have to admit.. it is pretty neat. I love that it’s adjustable for any pillow type! Never tried a pillow with water in it. Sounds neat! i like that it is filled with water. I like that it has thousands of 5 star reviews. —> Adjustable to anyone’s choice of support. Soft, Medium, of Firm. I love that you can adjust it so it doesnt have to always be one way.